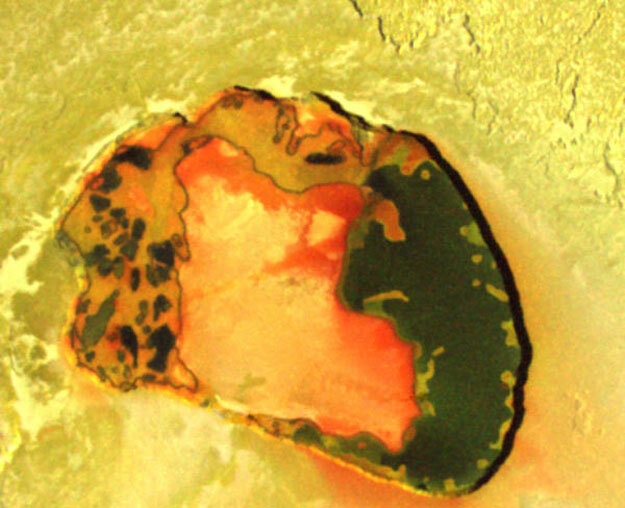 Explanation: What would it look like to peer into one of the volcanoes currently active on Jupiter's moon Io? The caldera of Tupan Patera, named after a Brazilian thunder god, reveals itself to be a strange and dangerous place, replete with hot black lava, warm red sulfur deposits likely deposited from vented gas, and hilly yellow terrain also high in sulfur. The robot spacecraft Galileo currently orbiting Jupiter provided the above vista late last year when it swooped by the active world. Tupan Patera is actually a volcanic depression, surrounded by cliffs nearly a kilometer high. The width of the depression is about 75 kilometers. As Galileo has filled its mission objectives and is running low on maneuvering fuel, NASA plans to crash the spacecraft into Jupiter during 2003.